THOUSAND OAKS, Calif. (AP) Tight end Gerald Everett played at two junior colleges and a university that dropped its football program before finishing up at a school that had never produced a drafted NFL player before him. Cooper Kupp set a barrel of NCAA receiving records, but he did it far away from the national spotlight at Eastern Washington. These two products of smaller schools have been united by the Los Angeles Rams, who hope they’ll grow up to become major targets for Jared Goff. 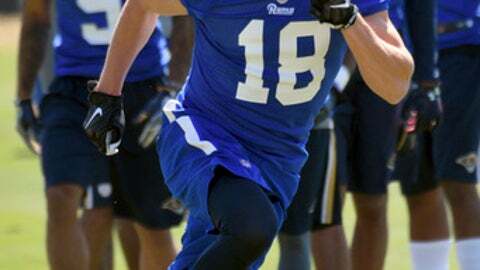 Everett and Kupp went through their first workouts Friday in the opening session of rookie minicamp with the Rams, who used their top two draft picks on pass-catchers with plenty to prove at the highest level of football. Despite their small-school backgrounds leading to the usual pre-draft questions about their achievements relative to their level of competition, Everett was chosen in the second round by the Rams, and Kupp was taken in the third. Along with free-agent receiver Robert Woods, the youngsters are the most important skill-position additions to the roster that produced the NFL’s worst offensive numbers last season. Goff was in the Rams’ training complex while his new teammates worked out under Sean McVay and the rest of Los Angeles’ new coaching staff. McVay also put the players through 90 minutes of meetings before two-a-day workouts. Everett is used to learning new offenses after the lengthy collegiate road that led him to South Alabama, but the size and scope of McVay’s scheme have left him expecting to spend plenty of time studying in the next few months. Everett and Kupp both overcame questions about their pedigrees with strong performances at the draft combine and private workouts. Both players are eager to show they’ve got the football sense to compensate for any physical shortcomings. Kupp is 17 months older than Goff, who went 0-7 in his first season as the Rams’ starter. The rookie already knows his new quarterback from offseason workouts because they are represented by the same group of agents. The Rams are hoping Goff grows up along with Everett and Kupp during the long weeks and months of workouts ahead of September’s season opener. NOTES: Former UCLA CB Ishmael Adams was expected to join the Rams as an undrafted free agent, but they waived him Friday after he failed a physical. … Los Angeles also waived former Auburn G Alex Kozan due to a non-football injury. … The Rams added former Utah DB Dominique Hatfield to their rookie group. The Los Angeles native played at Crenshaw High School.